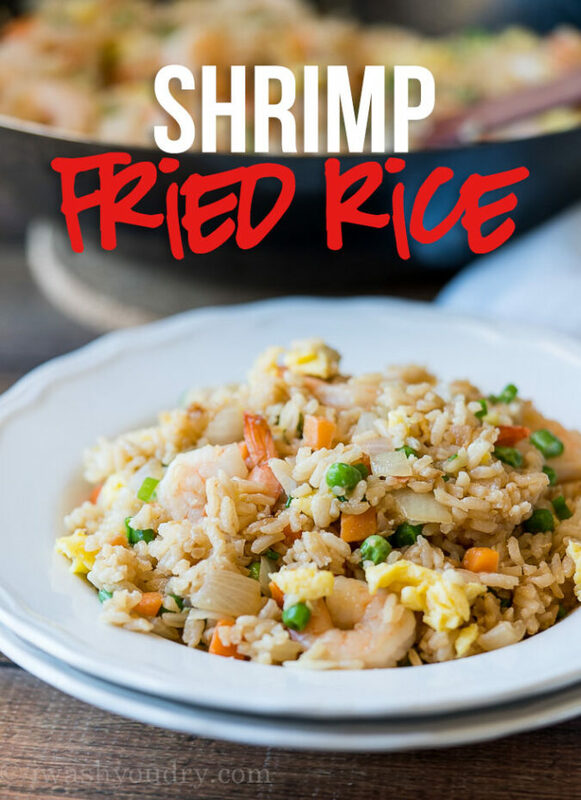 This super easy Shrimp Fried Rice is filled with plump shrimp, veggies and tossed in a perfectly balanced sauce. 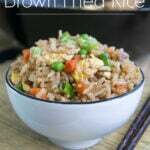 One of my favorite things to make is my Quick and Easy Brown Fried Rice. I can’t even begin to count the amount of times I’ve made it for my family. When I want to make the simple side dish into a complete meal I will fill it with plump shrimp or shredded chicken. 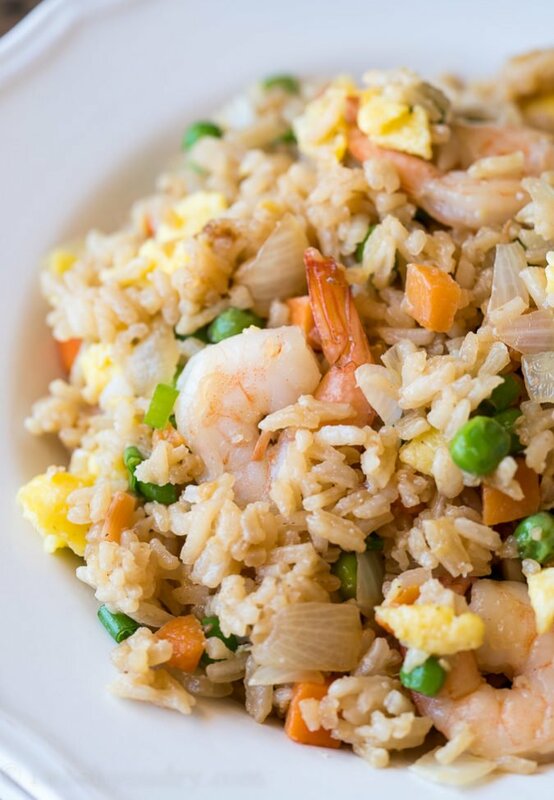 This shrimp fried rice usually takes the win because I always keep frozen shrimp in my freezer. 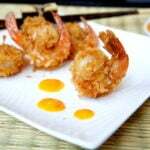 While I show this meal made with the shrimp tails still attached, you’ll most likely want to remove them when you make the dish. It’s a pretty presentation with the tails on, but eating it this way just isn’t realistic. 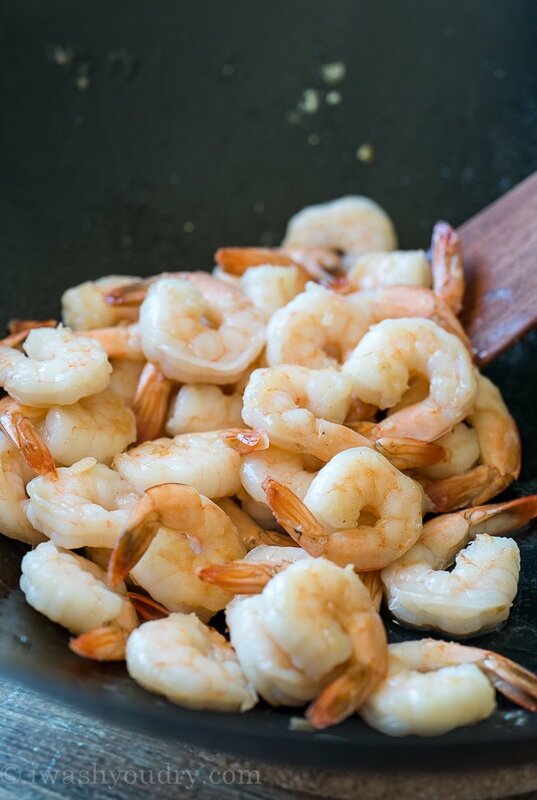 Start by sautéing your shrimp in a little bit of sesame oil until the shrimp are pink and curl in on themselves. I usually make this dish when I have a bunch of leftover rice to use up, but you can cook rice specifically for this dish if desired. My favorite rice to use is a Jasmine rice, which is a long grain white rice, but you can also use a brown rice. 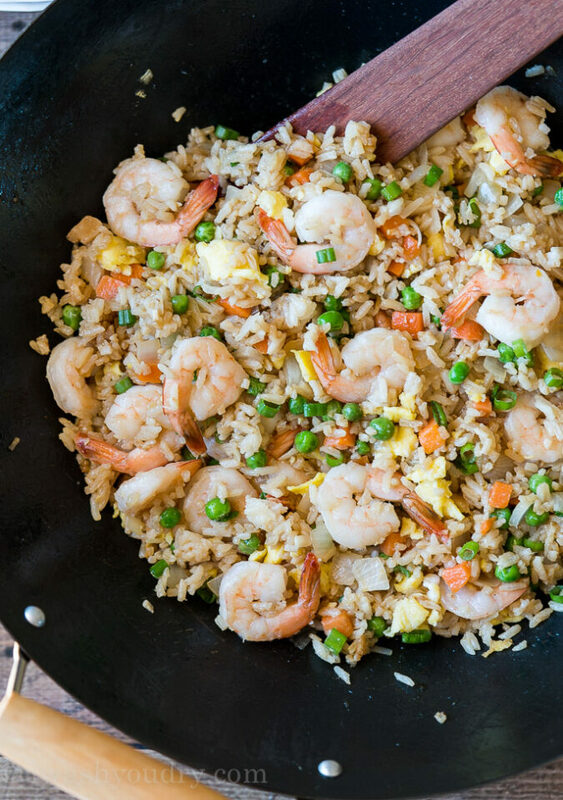 My favorite way to make this Shrimp Fried Rice is in a large wok. The sides of the wok are thin, allowing a lot of heat to hit the pan and give the rice a good fry in the sesame oil. It’s also plenty deep to hold lots of rice and veggies, plus it easily wipes clean when finished. 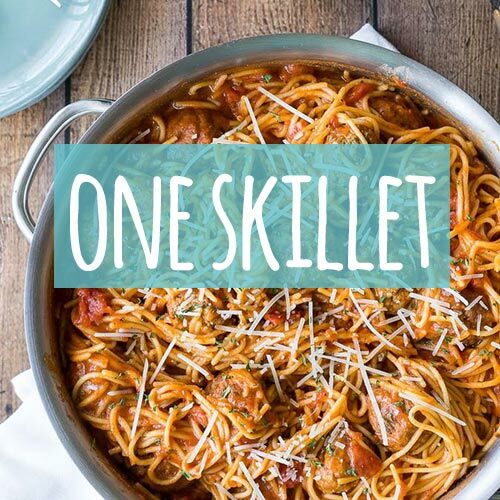 If you don’t have a wok, you can also use a large skillet with deep sides. I’m confident you’ll love this super quick fried rice recipe better than takeout and you’ll be making it over and over again! 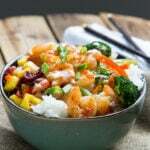 This quick and easy Shrimp Fried Rice is filled with plump shrimp, loads of veggies and rice and tossed in a perfectly balanced sauce. Heat 1 tsp sesame oil in a large wok or deep sided skillet over medium heat. Cook shrimp in skillet until pink and no longer translucent. Remove from skillet and set aside in a warm place. Coat the wok with non-stick spray, scramble the two eggs over medium heat then remove from pan to a plate to keep warm. Add the onion to the wok and stir, cooking until the onions have softened, about 3-5 minutes. Remove from wok and set aside. Add 1 tsp of sesame oil to the wok and stir fry the garlic and ginger for 30 seconds. Add the frozen peas and carrots and stir fry for an additional 2 minutes. Add the rice and stir to combine. Add the oyster sauce and soy sauce. Stir to heat through. Add the onions, eggs and shrimp back in the wok and stir in the green onions. Heat through, serve immediately. Enjoy! You can use cooked brown rice in place of the white rice if desired. Have you ever tried this recipe with riced cauliflower instead? I might try it and see how it turns out. Yes! I have and it works just as great! oil divided into into what? thirds? halves? green onions? yuk, why not wait until they are ready? You’ll divide the oil in the instructions. 1 tsp for the shrimp and 1 tsp for the rice. 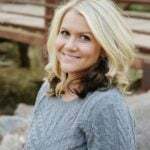 I love the name of your blog (although at my house it’s I wash, I dry)! 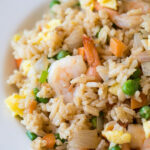 I also love the shrimp fried rice recipe – so easy!! 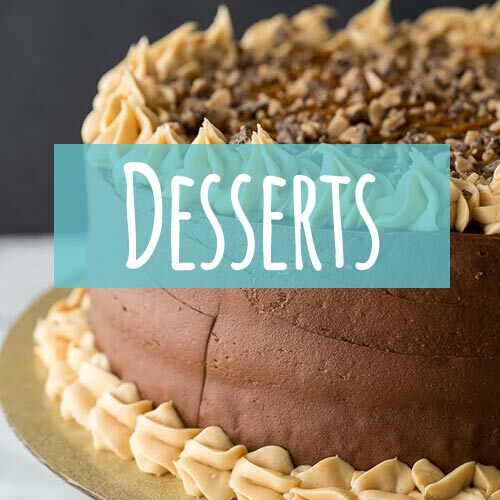 I host a blog party and would be honored if you shared some of your recipes!